ADHD can be caused by a number of factors. Often ADHD is a consequence of stress disrupting the normal functioning of the prefrontal cortex of the brain. However, sometimes there are deeper, more structural problems: ADHD can be linked to insufficient blood flow to the brain and an abnormally low EEG coherence. Irrespective of what may be causing the problem, transcending can help, because it essentially restores the brain to its natural setting which effectively impacts all three factors at the same time; the prefrontal cortex, blood flow, and EEG coherence. More detail below. Research shows: 3-6 months of TM leads to significant reduction in ADHD symptoms. In this study, children in the age group 11 to 14 years old with serious ADHD symptoms were randomly divided into a group that was immediately taught TM and a control group that had to wait 3 months before being was taught the technique. The TM group showed a significant reduction in ADHD symptoms after only 3 months of TM practice, while no improvement was noticeable in the control group. After the control group was taught TM, a similar improvement occurred in that group after 3 months, while the first group continued to improve. A technique can only be effective if the children can actually make use of it. In the case of TM, this turned out to be no problem, as the children enjoyed practicing the Transcendental Meditation technique. In response to the question “how much do you enjoy your TM practice” the average answer score was 5.3 on a scale of 0 (not at all) to 7 (a lot). Alleviating ADHD: What exactly does Transcending do? Transcending activates the body’s own healing power, allowing built-up tensions to disappear, even our deepest stress (see PTSD), and enables the full brain potential to be revived. The prefrontal cortex, the part of the brain right above the eyes, is responsible for our higher order thought functionality, such as impulse control, long-term planning, moral thought, and deciding whether something is right or wrong. This part of the brain is sometimes also referred to as the CEO or the Managing Director of the brain, as most decisions are made there. The prefrontal cortex is that part of the brain that sets human beings apart from animals. In a normal functioning brain, the flow of information will be as follows: Information comes in through the senses, is sent to the prefrontal cortex where it is processed, and then decisions are sent to the motoric part of the brain, which will direct the relevant muscles to respond.. Under the influence of stress the flow of this information is disrupted. Information no longer passes through the prefrontal cortex, which is now bypassed, with the information being sent directly from the senses to the motoric parts. There is a good reason why the brain is designed this way: for our survival. For example if we were crossing a road road while a car was fast approaching, we wouldn’t want to be in a state where we would first need to think about a response. We would need an immediate, impulsive response to jump away. There would be no time to think. The mechanism whereby the prefrontal cortex is disabled exists to protect us. However, this mechanism was not designed for situations of chronic stress. When someone is constantly exposed to stress, the prefrontal cortex gets permanently disabled. The thought process is then automatically reduced to short-term thinking, to impulsiveness. Many ADHD symptoms are linked to the inability to control impulsiveness. Essentially these are therefore linked to stress. Transcending lets the body enter into a deeper state of rest, allowing the body to remove even the deepest tensions and allows the frontal brain to become more active. This can be measured for example through neural imaging scans, which can measure the blood flow to the brain. The activity in the thalamus (related to bodily functions) drops, which is an indication for relaxation, while activity in the frontal cortex increases. ADHD patients generally have an abnormally low blood flow to certain areas of the brain. TM practice facilitates an increase in blood flow. 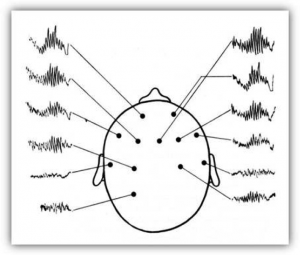 Any time part of the brain is active, electric activity occurs that can be measured through an electroencephalograph (EEG), a device that will display these electric impulses over time, in the form of a wave. These EEG wave shapes from the corresponding parts of the brain are then sent to a computer that (in real time) measures to what extent the different wave shapes overlap (i.e. show coherence). If the brain waves are fully coherent, this implies that the different parts of the brain are connected to each other. They function as one whole. 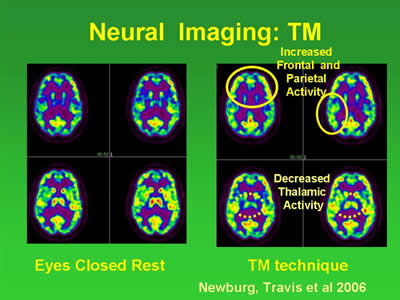 These changes in brainwaves remain unique to the experience of transcending as achieved through the TM technique. 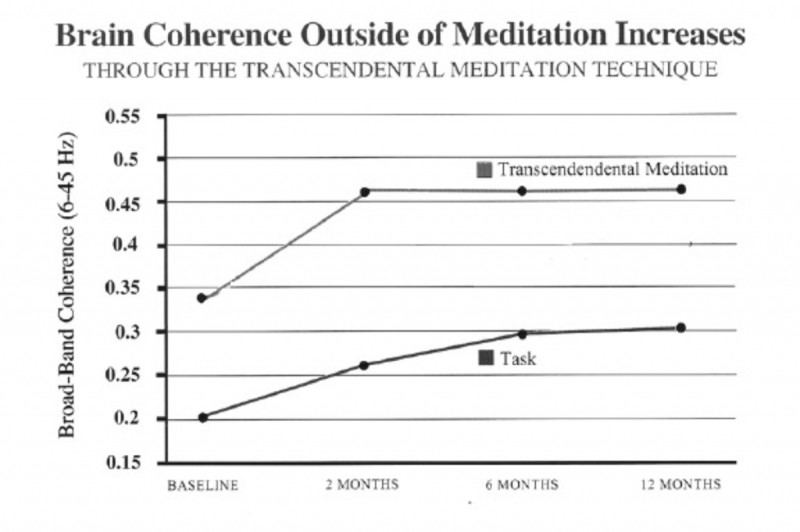 With other meditation and relaxation techniques this degree of high coherence has not been documended. The same was observed in the ADHD study. The below graph shows lines between the different areas of the brain that are coherent with each other. The coherence was measured at the start of the study and again at the end. The two were combined. The resulting lines therefore indicate an increased coherence (outside of TM practice) each time after a period of 3 months. Even though TM is proving to be both an enjoyable and an effective treatment, we nevertheless encourage you not to stop your normal treatment. Many ADHD patients soon notice that they will spontaneously require less medication, but it is very important for this to happen in small steps and in consultation with one’s doctor.